Home » PPI Claim » Have I Got PPI? Have I got PPI? That is a question that you certainly should be asking yourself as if the answer is yes it could mean you are entitled to receive a refund of thousands of pounds. So how do you know if you have PPI or not, well that is where we step in. As long as you know the name of the lenders you have had in the past we can look for you. No paperwork, no accounts numbers are necessary and don’t worry about how far back we can go: the oldest successful claim so far is 1987. With the lenders name we can approach them and locate your details, if there is no PPI, you will know and there will be no fee to pay. If we do locate PPI and can obtain a refund that is when a fee is payable which is 20% plus VAT (equivalent to 24% inclusive) of the amount recovered. What have you got to lose, you get to find out if there was PPI or not with the peace of mind that if there is not you have nothing to pay. I have over 30 years in the finance industry 18 of which I have been dealing with complaints on behalf of clients against lenders where I oversee all claims personally. You have probably heard all about mis-sold PPI on the news recently and you have also probably seen a number of adverts from companies offering to help you get compensation for the money that you were charged for this PPI. 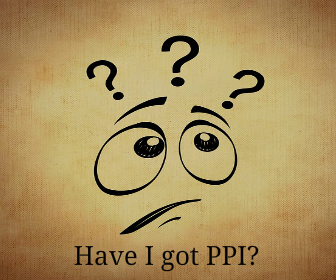 So what exactly is PPI? PPI is payment protection insurance and this product was sold with most financial products in the early 21st century. Because of the controversy surrounding the way in which it was sold to customers, it is rare for it to be sold these days. The reason for taking out PPI on a loan or credit card for example is so that it will insure the repayments of these debts. So what is the problem? Provided that you are working full time and are considered to be fit and healthy then PPI is there to protect you in the event that you are unable to pay your debt repayments because you are out of work. By paying these PPI premiums each month, the insurance company will pay your debts if you become ill or have an accident which prevents you from working. This sounds like a very good product to have and for that reason many people decided to take out PPI alongside a loan or credit card. What About Mis-sold PPI Claims? So you may be wondering what all the fuss is about in relation to mis-sold PPI. The problem that surrounds PPI is that a lot of customers were actually mis-sold this product. Customers were often paying thousands of pounds in PPI over the course of the loan but the product they were paying for was totally unsuitable for their requirements. In many instances, when customers tried to make a claim against their PPI insurance policy, they found they were not actually covered for their specific circumstances. Some customers were told or were made to feel that unless they took out the PPI, they would not get approval for the loan. There are many instances where PPI could have been mis-sold to customers besides lying to the customer about their chances of getting approval on the condition of accepting PPI. If the salesperson did not inform you that you could buy PPI somewhere else or advise you to shop around for a cheaper deal, then you may have been mis-sold PPI. The financial regulator has specific rules in place which state that there must be openness and frankness when financial products are being sold and unless you were told you had the option to buy PPI elsewhere, the lender could be in breach of these rules. Hopefully that answers the question of Have I got PPI and you are ready to take the next step in reclaiming your PPI. If you would like to make a claim with us please fill in the form on this page and we will get back to you within 24 hours. Back How Do I Know if I Have Had PPI? Next Is there a PPI time limit?